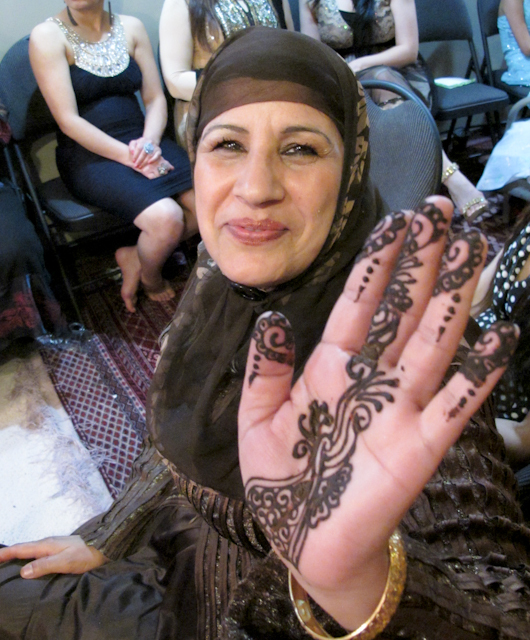 Recently I was lucky enough to be invited to my first henna party. I went with a group of women who were also new to this experience. The party was supposed to start at 6. We arrived just after 7, and things didn’t get going till at least 8:30. Women kept streaming in – perhaps about 80 in all. 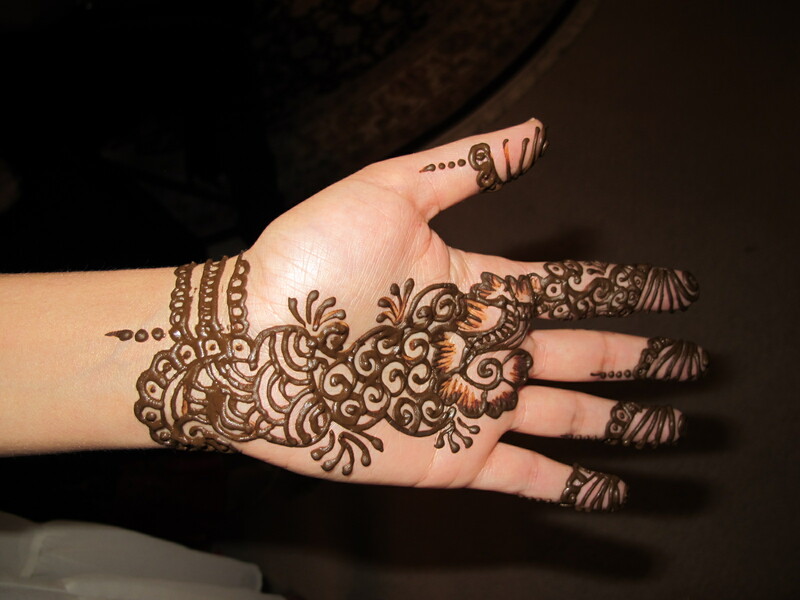 The bride must have had her henna work started early as she had her feet painted in a very elaborate design, plus several women had their hands done. 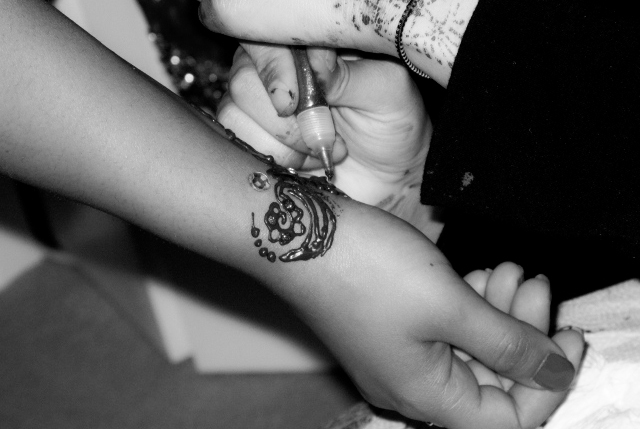 There was just one henna artist in attendance and she did beautiful work. Nearly all the women there were of Afghani descent. The groom and some of his friends arrived about 9 and then there was some intense photo time where everyone could have their picture taken with the future bride and groom. And I do mean everyone. After that could we get to the food – after the bride and groom of course. People were practically stampeding up the stairs to where a magnificent meal awaited! I love a good 10 pm dinner. The food was outstanding and all freshly made that day by the bride’s mother and her helpers. 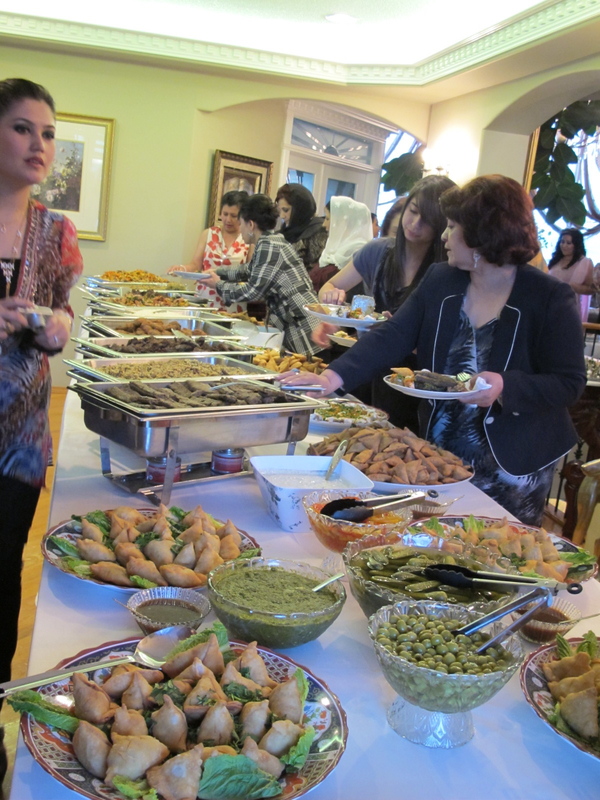 There was a seemingly endless supply of delicious dishes. By 10:30 I was fading and I left with a couple of friends. (Dessert and tea were yet to be served, so we uncovered a couple of desserts to sneak a taste before we left.) This is a culture of late night party people. Friends Catherine and her daughter, Leah, didn’t get home till 2:30 in the morning and they were not the last to leave. If this is any indication of how things are done, I will need to rest up before the upcoming wedding reception, and a late lunch would probably be in order.